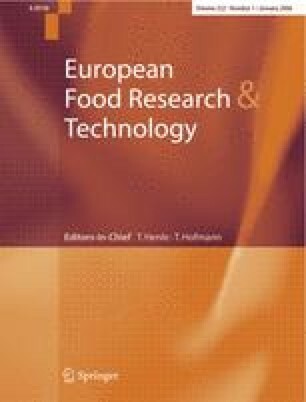 Phenolic profiles of nine red fruit commercial juice concentrates were characterised by means of high -performance liquid chromatography–diode array detection–mass spectrometry–mass spectrometry. Flavonoids such as anthocyanins, flavonols, hydroxycinnamic acid derivatives, stilbenoids, flavan 3-ols, ellagic acid derivatives, and other phenolic acids, were both identified and quantified in chokeberry, elderberry, blackcurrant and redcurrant, strawberry, red grape, cherry, plum, and raspberry commercial juice concentrates. Once the characterisation was carried out, the antioxidant capacity of each concentrate was assessed in vitro by means of two different methods: the 2,2′-azinobis(3-ethylbenzthiazoline-6-sulfonic acid) (Trolox equivalent antioxidant capacity) method and the 2,2-diphenyl-1-picrylhydrazyl radical method. Elderberry, chokeberry and blackcurrant concentrates were the richest in total phenolics and they had the strongest antioxidant capacity; therefore, these three juices may have huge interest as ingredients in the design of functional juices.